We already know that the Philippines is a huge sandbox tucked away in Southeast Asia, right between the South China Sea and Pacific Ocean. The 7,107 islands provide the perfect excuse to trade the leather shoes for flip-flops, don a bathing suit and soak up the rays of the tropical sun. Picking the most beautiful beaches in the Philippines is not an easy undertaking; there are just so many to choose from and there’s plenty more that are not yet known to the traveling world. Located in Palawan, El Nido is a less-expensive but equally stunning paradise destination in the Philippines. The entire Bacuit Archipelago where El Nido belongs to is a stunning collection of limestone cliffs randomly jutting out of deep turquoise waters. El Nido was once known as one of the most expensive destinations in the Philippines but its increasing popularity has brought along affordability even for the tight-budgeted traveler. To set things straight, there are no great beaches in the town of El Nido itself. But a few minutes away via pump boat, you can choose from a number of islands where you can have a beach all to yourself. Kayaking in the Big and Small Lagoon of Miniloc, arranging a private lunch in Entalula Island and watching the magnificent sunset in Pangalusian Island are must-dos. And for the more adventurous? One can always channel Tom Cruise and do some rock climbing! Let’s head up north. The coastal resort town of Pagudpud in Ilocos Norte is an attraction in itself but the most stunning beach in the area is undoubtedly the Blue Lagoon. It’s not easy to reach: a plane ride to Laoag and the scenic road trip to the town itself are required but worth every minute. The Patapat Viaduct is the Philippines’ version of the Great Ocean Road, proving jaw-dropping views coveted by every photographer. Blue Lagoon is actually part of Maira-ira Beach and it is considered by many as the Boracay of the North. The crystal clear blue waters of the cove are made more charming by the verdant jungle creeping close to shore. Several commercial establishments have made their way into this once-unspoiled beach and one can only hope development will not bring Blue Lagoon its detriment. Whenever Siargao is mentioned, the mind immediately zeros in on the giant waves of Cloud 9 coveted by seasoned surfers of the world. But this island group has so much more to offer than the exciting swells and Bob Marley-like beach life. Once the surfers put their boards down, I’m pretty sure they go somewhere else to simply sit back and admire the paradise they’re in. Less than an hour via boat from Siargao, Dako Island is a coconut-lined beach with rustic beauty and simplicity. The sand quality of the island is comparable to that of the other most beaches in the Philippines but what set it apart from the rest are the coconuts that grow along its shores. Travelers who have visited Dako claim to have tasted the sweetest coconut meat in the country. You can stay the night in one of the cottages on the beachfront but nothing beats pitching camp and gathering ‘round a bonfire on a beautiful beach, right? 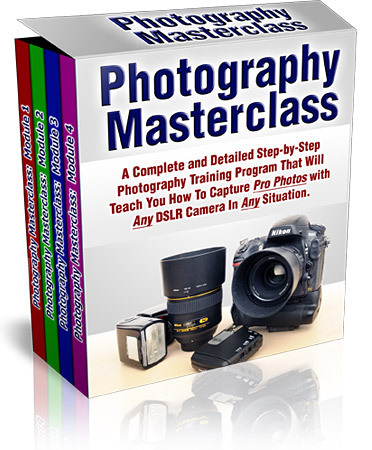 Thanks to the world-famous reality TV show Survivor, the travel spotlight is now trained on Camarines in Bicolandia. The Caramoan Islands of Camarines Sur being the set of the latest season of Survivor, the pristine beaches of this part of the Philippines has sparked much interest among the traveling population. But aside from the now-famous Caramoan, the Calaguas Islands of Camarines Norte also offers breathtaking white sand beaches and inviting waters, making it worthy of being called one of the most beautiful beaches in the Philippines. Mahabang Buhangin (Long Beach) in Tinaga Island, Calaguas is an extensive stretch of powder-fine white sands caressed by emerald waters. The beach has a charming raw beauty that makes it a great destination for adventurers. There are no large resorts nearby and you may have to pitch camp if you want to stay overnight. With great stories, a few buckets of beer and a bonfire, a night or two in this beach is well worth the trip. 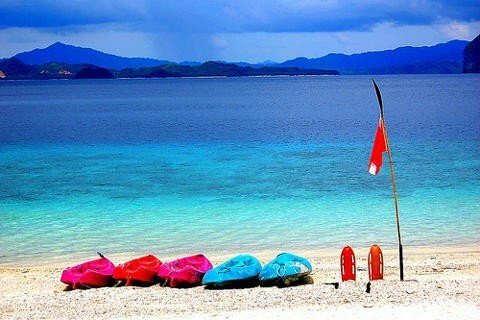 Now let’s jump to the beaches of the Visayas. Tucked away behind the bigger island of Bohol, Panglao Island has long been recognized as home to one of the most outstanding beaches and dive sites in the world. It is an all-in-one destination: white sands border the island, welcoming clear blue waters which are home to colorful marine creatures and live corals. In mainland Bohol await historic sites, rivers, caves, the curious Chocolate Hills and the cute tarsiers. Alona Beach, the most popular sandy strip in Panglao is lined with palms and coconuts, providing a magnificent backdrop for photos worthy of the world’s best travel magazines. There’s something for everyone on Alona Beach: watersports, sun beds, spas, great food and a long stretch of beach where you can do just about anything. Just off the coast is a great spot for watching dolphins play in the water and chase the sunset. If you’re traveling with little concern on how much you spend, perhaps a couple of days in Pamalican Island will interest you. And while its hefty price will certainly make your jaw drop, its amazing beauty will also take your breath away. Not everybody gets the chance to set foot on the island; the expensive charter flight makes sure of that. Pamalican caters to the traveler’s desire to escape to a remote island; it’s simply the perfect place for a romantic proposal or honeymoon. Pamalican is home to the country’s most exclusive resort, Amanpulo. It gives its visitor the impression of having an island all to himself; the turquoise waters, abundant underwater kingdom, lush foliage and world-class resort amenities are all just within easy reach. If you want the ultimate island getaway and have the resources to afford such luxury, go ahead and book that charter flight to paradise. 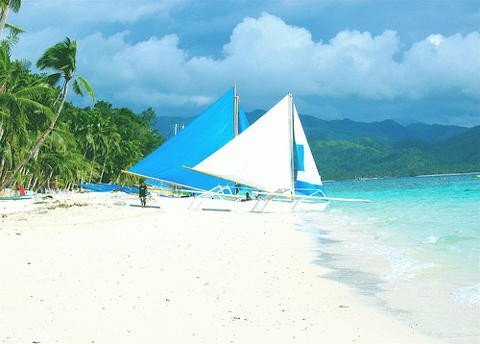 There’s no Philippine beach more celebrated than White Beach in the ,a href=”10-fun-things-to-do-in-boracay”>famous Boracay Island. The almost four-kilometer stretch of pure white sand as fine as confectioner’s sugar is a favorite playground for beach lovers and the island’s cornucopia of resorts, restaurants and watersports vendors make it even more exciting. The epic parties complete with skilled fire dancers and thirst-quenching beverages from all over the world are also reasons why tourists find their way into the island. Boracay’s White Beach is a free-for-all sand strip lined with all sorts of businesses: high-class resorts, quaint guest houses, bars, restaurants, tour providers, even a strip mall where you can buy just about anything! Also on White Beach is the iconic Willy’s Rock which serves as a grotto of the Holy Virgin. Boat Station 1 is the quietest part of the beach and it has the widest shoreline. Boat Station 2 is where all the action is and Boat Station 3 is the most bohemian part of White Beach. 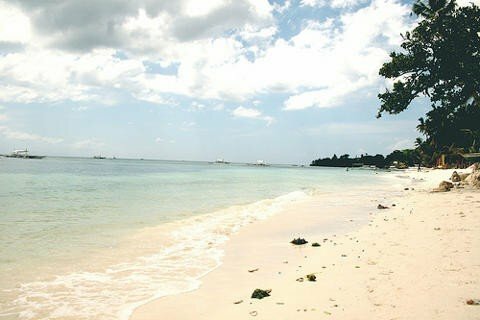 Also in Boracay Island is Puka Beach, a peaceful beach where you can find the pretty puka shells. 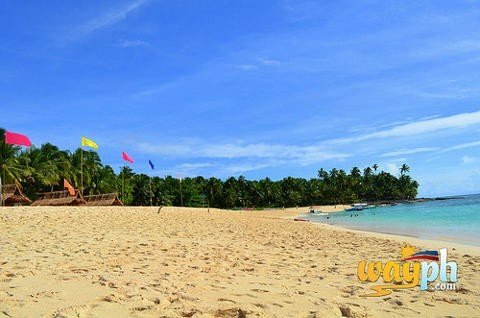 There’s also Bulabog Beach, the perfect place for adventurers who love kite boarding and other extreme water pursuits. Located at the northern tip of the mainland Cebu, Bantayan Island can be considered one of the province’s best kept secrets. Unlike other islands in the country, Bantayan has been relatively kept hidden and it has maintained its relaxed and laidback vibe. The island is a real gem; it has all the prerequisites of the great island getaway and yet it offers an ambience that does not make you feel that you’re an outsider. The small-town feel of Bantayan Island is its major draw. There are no large resorts in the island, most establishments are small and have perfectly blended into the local community. Getting to know the locals is a great experience in Bantayan and so are hopping to nearby islands and snorkeling in the clear waters. Imagine this: an uninhabited island surrounded by blue waters with a backdrop of towering mountains. 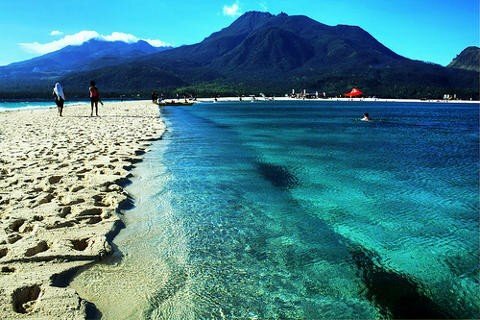 That’s exactly what awaits every traveler in Camiguin, the mysterious island in Northern Mindanao. The island is fringed with white sand beaches sloping to majestic reefs. Known as the Island Borne of Fire, the island is also teeming with volcanoes and hot springs. Its most prominent volcanoes, Hibok-hibok and Vulcan have left indelible marks in the island’s landscape, creating one of Camiguin’s most visited attractions: the Sunken Cemetery. Just off the coast of Mambajao is White Island which is actually a sandbar that never seems to maintain its shape. White Island provides some of the most picturesque views of Camiguin and there is almost never a tourist who leaves without having his/her jump shot taken with the island in the background. White Island is totally barren; no trees or huts, just fine white sand, the sea and the glorious sun. And now we’re off to Mindanao. Just like Luzon, this huge island is surrounded by a great number of smaller islands and Samal is one of them. Located very close to Davao City, Samal has become the fastest growing tourist destination in the country. Its accessibility and awesome beauty is drawing more and more travelers into its tree-lined shores every year. At the mention of Samal Island, no one misses thoughts of Pearl Farm Beach Resort, one of the premier destinations of the region. Pearl Farm has one of the most beautiful beaches in the Philippines; the standard white sand and clear waters are complemented by world-class amenities and lovely cottages on stilts opening to striking views of the sea. The waters are perfect for snorkeling and if you’d want to see more of Samal, an island hopping tour can always be arranged. Don’t forget to ask your guide to take you to the Vanishing Island! Are these beaches on your list of the most beautiful? Are there others you would include? Let us know what you think in the comments below.